Although not listed as endangered by any governing body, the modern koala population is in dire straits. Urbanization, deforestation, and unregulated habitat destruction have all put these animals at great risk of dying out entirely. It’s time for loggers in Australia to start acting more responsibly – and one company is meeting the challenge with the latest drone technology. Hazelwood Forestry, a company based in Victoria, Australia, harvests eucalyptus and pine trees from the Hancock Victoria Plantations in the Strzelecki Ranges of the Latrobe Valley. Koalas famously love eucalyptus leaves, and are therefore in extreme danger during tree-felling operations. Companies like Hazelwood will often begin each work day with a “koala spotting” check, but this has traditionally been a difficult and lengthy manual process that doesn’t always produce accurate results. Even young eucalyptus trees can have incredibly dense foliage that makes it hard to spot any small animals hiding in the branches. That’s why, after six and a half years of manual spotting, Hazelwood decided to purchase a drone equipped with thermal imaging software and take their practice to the next technological level. They have not named the specific make or model of drone used, but described it as a “spidery-looking” ‘copter that weighs 22 pounds, can reach speeds of up to 40 miles per hour, and was specifically chosen because of its ability to withstand strong winds. Eloise Cluning, the company’s co-owner and operator, said that “It’s difficult to move around, and is probably the biggest off-the-shelf registered drone you can buy.” This is clearly one of the heavy lifting drones that we wrote about here, most likely the Versadrones Heavy Lift Octocopter. 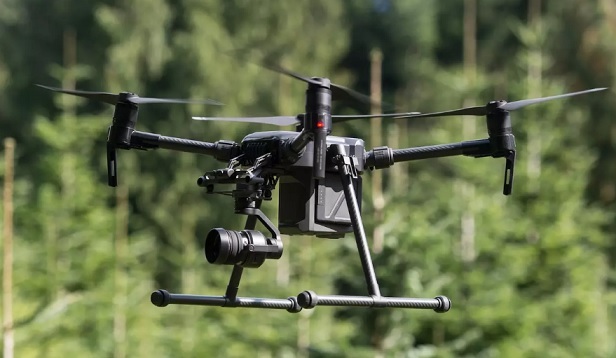 Once equipped with the thermal imaging sensors, this drone can scan the thick tree foliage for heat signatures. Once something living has been spotted, a Hazelwood employee has to check to see if it’s a koala, a wombat, or a bird that can be shooed away. The thermal imaging is not yet good enough to distinguish individual animals based on heat alone. Rain or fog can make the animals even harder to spot. However, the technology has still allowed Hazelwood to act quicker and more accurately to protect koalas from death or injury. If a koala is spotted, Hazelwood has a permit from Victoria’s Department of Environment, Land, Water and Planning which gives them the right to humanely capture and translocate these animals to somewhere that’s out of harm’s way. It seems that the heavy duty drone is too large for a single eagle to attempt to take on – they shy away from the large noise and fearsome shape of the aircraft. But if there are several eagles together, they perceive the drone as a threat and will attack it. Obviously, these birds of prey have never read our rules for flying etiquette! It’s clear that this technology still faces a few challenges – “kinks to be worked out,” you might say. But we at Dronethusiast are proud of Cluning and her company for refusing to take the easy way out and trying to make sure that conservation isn’t just the right thing to do, but the easy thing to do, for them and for any foresters who use their techniques and improve upon them. We all have a responsibility to take care of our beautiful world, and with the affordable, practical, and radical drone technology that is now available, doing so has become easier than ever. Note: This article was edited on 4 September 2018. Previous versions of this article inaccurately suggested that the thermal imaging software used was manufactured by Kespry Inc. A representative from Kespry informed us that the company has not shipped out any thermal product yet and was not involved in this project.